The Dark Ranger: Drunk With Power? There was a time when Tom Renney would ignore the cries raining down from the crowd to bench a player. Apparently Renney has seen the light.... in fact, he's probably tanning by it as you read this. What started a two weeks ago with the benching of Brandon Dubinsky, capped off (or at least we hope so) with the benching of Zherdev and Voros for a single game against Ottawa last night. Hey look on the bright side, at least Colton Orr got some powerplay time. Um, ....what? That's right, "Bobby" (a nickname Orr was given by his Teammates) saw time on the powerplay. Now coming off the summer, I have been one of Orr's biggest advocates. Seemingly the hardest working and most improved guy over the summer, Orr deserved more ice time for his efforts and more importantly his results. Does he belong on the power play, yeah sure... if we're up by 3 with 5 minutes to go... which was hardly the case last night. Who am I to question, right? This is Tom Renney's team and he now rules it with an iron fist. All opposing voices and opinion have been vanquished during free agency. There's only one dominant personality now, and it scribes away in a notebook, whispers in players ears and then slaps them on the shoulder to try to motivate them. Their reaction, perhaps confusion. The opinion of many is that Dubinsky hasn't quite played the same since his benching and only time will tell how it affects Voros and Zherdev. Well perhaps the verdicts already in on Zherdev. The winger was called upon to shoot first in the shootout after being benched earlier in the game for an extended period of ice time. Just the same, Zherdev went out scored his goal and returned the bench with no exuberance or jubilation at all and in fact almost seemed to wave it off in frustration/dismissal. While his English may not be good, his body language spoke volumes and his absence when his name was announced as a star of the game would seeming provide punctuation. Growing pains? Do we have another premadonna our hands? Neither was a cause for concern when the wing was signed, due to the nurturing reputation of our coach. So does the possibility of a situation with Zherdev come as a shock? Not to me... This is status quo for our coach. He coaches/ or non coaches himself into a corner and then looks for someone to bail him out. Usually its not a player he'd admonish minutes before. WELL SOMEONE ACTUALLY SPOKE SOME TRUTH AROUND HERE!!!! Sending a message by sending out Colton Orr? isn't that what he is supposed to do at all times and why has Aaron varos suddently become flacid? Benching and playing and patting on the back has confused such veterans as Jagr, Shanny to the point where their star power was greater than Renney's idea of how to coach: passive/aggressive. If you saw him at the game last night, he was screaming pretty much throughout the third period --- and what did he do about it? Send out Orr to police the ice! Nice. When Ruutu during the shootout, double shot at the King - rather than complain and bang on the ice wiht your sticks, THE F**KING BENCH SHOULD HAVE CLEARED> I am so angry as a Rangers fan. But we're winning? Not sure what the hell is going on! Now, if Zherdev became the scoring machine many expected and Gomez was healthy and in top form,that Voros top line argument would have some merit... but I'd still have trouble taking stock in that based on schizophrenic nature of our coach. With a coach like Lemaire or Hitchcock, at least you more or less know where you stand. Speaking of which, you'd have to wonder if Zherdev sent Hitchcock a dozen roses after the game last night. When we were off to a fast start, it was said that the players were buying into the coach's system. I think thats being reevaluated now on a game by game basis by many players. Its hard to understand what message Renney is sending right now that he's benching guys left and right. That has to leave some players wondering if they truly have an idea of what the coach is expecting out of them. Renneys role playing right now and not even he knows what hes doing. We're winning games with unpredictable,sometimes anemic offense, because we have Henrik performing damage control. 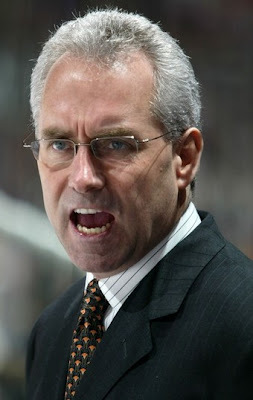 Renney is vocal about his disatisfaction, but he'll take overtime wins, shootout wins,overtime losses, brownie points, chucky cheese dollars and whatever else he can get now. The big question may not be why a guy like Voros has dropped off, but whos next? the guy is playing poker -- and the team knows it. does anyone know why he was fired from Vancouver? Avery is a gimic. Yes he was/is a good hockey player but nothing extraordinary. It's not hard to excite a team and push them along when lazy Jagr was alongside but Sean is not proving himself in Dallas one bit. His particular type of agitation already exists in their general management - so he is moot. Voros was part of a bigger trade -- we need to get Backman and tyutin off the plate right? those were the guys we dumped for Zherdev too? right? who the hell knows for sure. voros and put up numbers comparable to avery with one big exception so far. there is no target on his back , which maakes for a healthier team atmosphere. Avery is and will always be toxic and can't be in the same locker room for more than two or three years in a row. he's a jumper, which is why is will jump out of the closet and into Vogue. I am beginning to think 'J' is touching on a nerve here...The Ranger Pundit has eloquently named him COACH CLUELESS, which pretty much sums up his philosophies. sean avery MADE the Rangers last year so I disagree with most of what james says (except for the target on the back). Anonymous, Bettman is a tool. - yes. DJ - I agree that the bench should have cleared on the shootout. It was irresponsible to put up with such crap -- how is that any different than taunting M-A-R-T-Y!!!!!!???? OK, maybe just slightly different. Keep it up J...I like the discussions. Yes, Avery for all his agitating abilities was still never more than a good player at best. But grading a player should also involve looking at what he provides in the given setting. The reason hes not as effective in Dallas as he was here is he's is buried amongst a lot of straight laced guys that never really had a problem sticking up for themselves but were content just playing the game. They had good mix of players an all star goalie and Ott (a major jack@$$ in his own right) and before that barnaby. They didn't need the grit as much as they needed the attraction and a few goals. Dallas didn't need as much snarl from Avery as we did. Moving backman and tyuts was definitely a priority and in Zherdev, we got back a guy that had a big offensive upside. Despite my feelings that we were replacing and old moody jagr with with a potentially young moody jagr, I still think its a good deal. However, considering that hes not cemented here yet and would have to be resigned, this is a bad time for the coach to shake his tree. "Kid gloves" as someone else said. Voros was part of the Avery replacement plan. Sather was pretty transparent on the avery situation at the start of free agency. Fritsche was a throw in on the Zherdev trade, but Voros was seen as a half replacement for Avery's gritty style and Shanahans workmans effort. Jamtin (nicknamed the swedish Avery)turned out to be anything but that and got on the first thing smoking back to Sweden a few weeks ago. The numbers for Voros and Avery maybe comparable. While I agree that Voros doesn't have the target on his back. That may in essence, be the problem. Noones worried about Voros, except maybe Mike Smith (and it seems like Smith handled that situation to his satisfaction). Whats true of Voros is true of most of our team now. They are nameless faceless cogs of a machine that works sometimes. Now let me say that I cringed everytime Renney used to comment about Jagr that "as he goes, so go we..." It seemed like a lot to put at stake in one player. While I wasn't the biggest fan of #68, I do realize that he was a special player and it was fairly unreasonable to expect every player to follow his lead on the ice. The same couldn't be said for Avery. He played with snarl threw some checks got in peoples faces, stood up for teammates... something that most players should be capable of. Whenver he played, every ranger's B@ll$ got a little bigger and they played with fire and the opposing team diverted at least some of thier attention to dealing with Avery. This team has no fire and no snarl and whats more noone thats even close to bringing that kind of edge. Renneys slogan is now "As I go, so go they..." A big narcissistic and egotistical but understandable if he had a pair and a clue, but he doesnt and its bleeding down to the player cogs of a souless machine that probably recites the boy scout oath before they take to the ice each game.